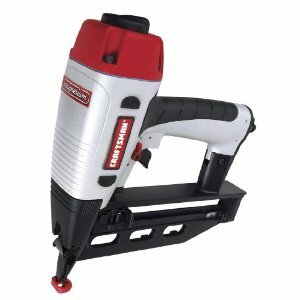 I decided I need this 16 gauge finish nailer from Craftsman in order to make a few simple pieces of furniture that I need and can’t seem to find anywhere. After looking online and comparing models I decided on this one sold at Sears.com. Actually I bought a kit that contained three pneumatic tools including the finish nailer, a pin nailer, and a brad nailer. It was only about $20 more to buy the whole kit, what a deal!